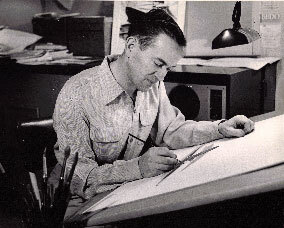 Frank Soltesz had a natural talent; he grew up as a small-town boy who loved to draw pictures and grew up to become one of the finest commercial illustrators of his time. Frank Joseph Soltesz was born on June 14, 1912 in Derry, Pennsylvania, where his father, a Slovakian immigrant, had a saddle and harness-making shop. Soltesz' first big push into becoming a professional artist came around 1933 when he enrolled in the Art Institute of Pittsburgh. After two years at AIP, he got a job at the Pittsburgh Press and then later at advertising agency Rayart Studios. In 1945, Soltesz got another big push. Jack Frye, President of TWA, saw Soltesz' work and offered him a job doing TWA's magazine ads. Soltesz' work appeared in all the major periodicals of the day: Life, Colliers, Saturday Evening Post, Esquire, Sports Illustrated, Forbes, Fortune, Time, Business Week, U.S. News and World Report.